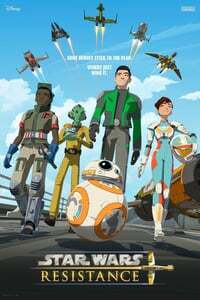 Set six months before The Force Awakens, Star Wars: Resistance is a 2D animated return to the Galaxy Far, Far Away, that premiered on Sunday, October 7, 2018. Set on a massive refueling platform on an Outer Rim ocean planet, Kazuda "Kaz" Xiono, hand picked by Resistance ace Poe Dameron, sets about uncovering a First Order presence on the station amidst an atmosphere of starship racing by some of the greatest pilots in the galaxy. Joining Kaz on the platform, "Colossus" are Yeager, Tam, Neeku, and their trusty, slightly rusty astromech, Bucket — together, they form Team Fireball, named for Kaz’s ship. The X-wings in the opening sequence are the T-85 model — the latest version of the craft first introduced as the T-65 in the original Star Wars. The X-wings seen in the Resistance are a slightly older model, the T-70. Hyperdrive-equipped TIE fighters were a rarity in the days of the Galactic Empire, but the current technology of the First Order makes it possible, especially in high-end models like Major Vonreg’s ship. Greg Proops returns to Star Wars to voice a race announcer, but it’s not the two-headed announcer from Star Wars: The Phantom Menace’s podrace. Although the voice is the same, it’s more akin to a copycat invoking a classic announcer style. Gorgs were first introduced in the Mos Espa street market sequence of The Phantom Menace. A hapless Jar Jar Binks tried to eat a gorg from an angry vendor without paying for it first. Check out the episode guide page for its list of databank entries and art from the show. This was... fine? I dunno what I really wanted from it but I started watching without any real expectations. When it was over and I went to read up more on where it's going, turns out it's mostly focused on Kaz and the people of the Colossus, with stuff about the First Order in between. I'm not sure how I feel about a very local setting for Star Wars, but I'll see if it works. The other series take you all over the place and that's what great about them. Kaz is kind of annoying though, and him plus Neeku is just cringy comedy that I don't really embrace. I'm sure kids love it, but I think I need more convincing. That said, I'm looking forward to see how they portray Captain Phasma! I quite enjoyed it, but I did go in with little in the way of expectations. Animation wise, I think it does a great job, and it joins The Dragon Prince as one of the best new animated shows of this fall. The character animation, as well as background animation, is top notch and I'm always hearts for animation that plays with light and shadow - a Lucasfilm hallmark for their animated shows. The music was serviceable, but it didn't blow me away. After four years of Ezra, I found I rather liked Kaz. I can appreciate weariness with Neeku, his character really runs that line between endearing and enraging. It also helps that I'm working from this episode and two others (currently viewable on DisneyNow streaming service). I'm waiting to put those episodes up since they haven't officially aired on tv. (Phasma makes her first appearance in the third episode, FYI). I love that TFA actors are happy to loan their voices to their characters. It adds a nice touch of genuineness to the show (Oscar Isaac so far, Gwendoline Christie to come!). That said, one voice actress did get herself in hot water last week, literally hours after everyone applauded her appearance as General Leia - Rachel Butera. During the Dr. Ford testimony, Butera thought it would be funny to share her imitation of how Dr. Ford spoke and responded on Twitter. The disgust came down so hard she deleted the video and then her account. Ever since people have been advocating for Lucasfilm to replace her in any future productions requiring Leia's voice in the show. (Here's an article about the fiasco). Oh yeah, i did notice that while it had the same animation style as The Dragon Prince, it wasn't choppy at all and was really well done. I guess that speaks to budget differences. If I have been watching all the "live" movies in the SW series, but so far have not watched any animated ones, is this required watching? That is, do things get revealed that I will wish I had known when the next (and presumably last) movie in the trilogy^3 comes out? I don't think so. The likelihood of something being dropped in Resistance having any greater resonance in Episode IX is very slim. At best, it might be a fleeting cameo or passing off the cuff reference to something or someone. Presumably, the show will catch up to The Force Awakens and by default, also The Last Jedi, and the one thing I learned from the last time Abrams helmed a Star Wars film; he has no problem telling every other creative project to stay on the sidelines or hold off until he's done with his own project. Counter argument would be that the lead time into producing this show meant that all the first season episodes were probably already written by the time Abrams began writing his own script for Episode IX; and an industrious member of Lucasfilm could always find a way to slip something in. BUT, I'd bet good money, if they did, the relevance factor would be pretty low. J.J. gonna do his own thing. This show is probably best enjoyed as the opportunity to simply see the galaxy at the time just before TFA fleshed out more. In this first episode, there's name dropping of "Scarif" to "Jakku," which are the major battles that bookend the rebellion against the Empire; for example, but I haven't seen anything on a major level that requires past knowledge beyond that. TLDR; no, you don't need to worry about watching this show to prepare for Episode IX. From what I read this fills in the gap between the Episode VI and VII (the last of the original trilogy (Return of the Jedi) and the first of the current one (The Force Awakens)). We can potentially find out how the Starkiller Base came to be, and perhaps more info on Snoke.